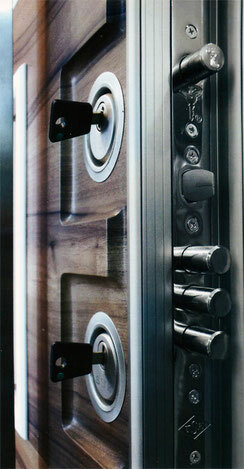 Our doors are designed for security purpose, and customised for life. - De website van pearldoors! Our doors are designed for security purpose, and customised for life. 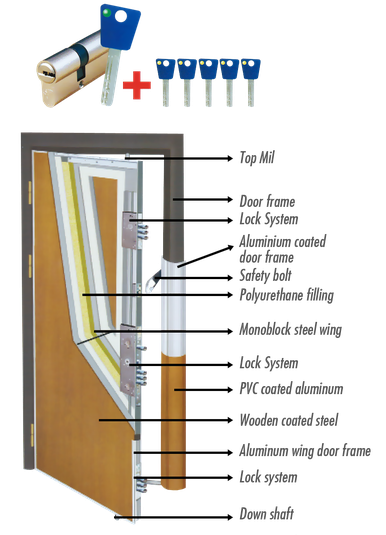 Sur Security Door has implemented R-D studies that focused on security question under the concept of "The World's Most Secure Door" and its inventions on the subjects of security and durability wre found qualified for patent certification. It required the British Chiltern Institute, the most qualified test laboratory in its scope to test strenght of it's recent excellent security elements against forceful sledgehammer, cutlery applications and fire and it was accredited in international level by the issue of "Chiltern Dynamics" and "Chiltern International Fire" certifications. EN-1627 standardisation that is the safest level in the world and it has achieved the endurance test level regarding its lock part and it was approved on basis of available reports. With a product range combined with security and aesthetics the quality of Sur Security Door is just as you deserve. Appearance is significant for all of us. We all wish we look beautiful, presentable or nice in the point of others' view. It is primarily possible to see in their home the importance paid to appearance of people who embraced a qualified way of life. And sure that beauty of a home at first starts on the exterior door. "Exterior Door of a Flat" is the first impression point for a home, presents hints, carries traces of the householder. According to researches made, duration to make decision whether you purchase a house or not is about 8 seconds. Half of this short time elapses in front of the exterior door.
" Buyers decide within 8 seconds whether they are interested in your home." So buyers pretty much know. Sellers - remember that! That first impression (or at least the first 8 seconds) can decide whether the buyer is interested in your home! Result arisen out of this research is expressly demonstrating us that: Security door is the most important element in the course of making a decision. Colour, material, style, strength of security door and impression it creates in your mind may enable or unable you to sell it. An exterior door combining its design and aesthetic with security makes your home move valuable. A green colored podger is temporarily used during production, transportation and assembly of your security door in the course when the door is delivered to the end user, if one of the 5 yellow keys that comes in a sealed plastic bag, with the door, is used, the password of barrel automatically becomes void. Thus the customer is provided with the opportunity to use his own keys safely.